There’s something astonishing with Great Britain: there are stories which are able to connect citizens, consumers, governments, foreigners, brands, in the very meantime. 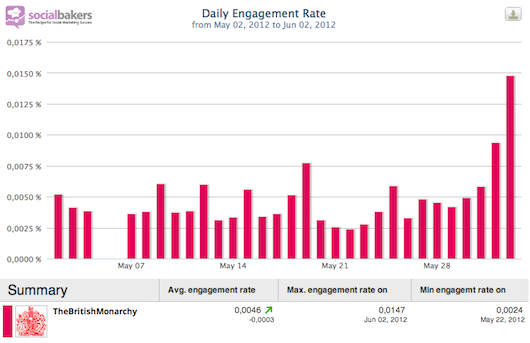 I had the chance to experience the Diamond Jubilee, and it’s probably one of the most amazing Social Media case studies since Obama’s campaign. 1 billion+ tweets according to The Telegraph and that’s more than the Kate & William wedding! But it’s not really the point. The point is that in any store, in any street, there was a deep commitment of a nation with this celebration. To be honnest, I’m a bit jealous of Commonwealth people today, because it was not about an identity which denies the other nations, but it was about an hyphenated identity which opens the gates. In Tesco supermarkets, you could have some fun with Union Jack flags and goodies. At Barclays, every customer could receive a special package. Why not a popular branding of the European Union then? A very interesting popular fact can also be presented: Jubilee anthem “Sing” by Gary Barlow, is now #1 in diverse UK music charts. So why did it work so well, apart the fact that British LOVE their Queen? a lot of stakeholders had a strong value proposal: business? holidays? meeting friends? reinsuring the British nation?